RT3 - Real Time for Real Trees with Real Shape, our newest generation primary log breakdown system, has evolved from scores of primary breakdown optimization systems supplied by Porter. 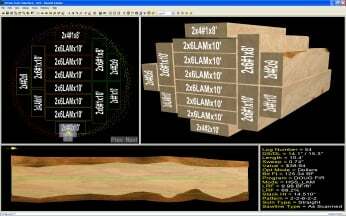 RT3 incorporates high definition scan data from multipoint laser scanners and the latest Core 2 Quad Industrial Computers to provide accurate true shape log profiling and computer modeling. The highest recovery and value for each log is thus achieved.